SALT LAKE CITY 27 January 2008 President Gordon B. Hinckley, who led The Church of Jesus Christ of Latter-day Saints through twelve years of global expansion, has died at the age of 97. President Hinckley was the 15th president in the 177-year history of the Church and had served as its president since 12 March 1995. The Church president died at his apartment in downtown Salt Lake City at 7:00 p.m. Sunday night from causes incident to age. Members of his family were at his bedside. A successor is not expected to be formally chosen by the Church’s Quorum of the Twelve Apostles until after President Hinckley’s funeral within the next few days. On a wall above the desk where President Gordon B. Hinckley directed the affairs of the LDS Church hangs a portrait of Brigham Young. Hinckley felt an enduring kinship with the pioneer prophet who, by sheer force of personality, brought the Mormons to a safe haven in the mountains. Young built a city and a Great Basin Kingdom that transformed the West. Over 73 years, Gordon B. Hinckley built the image of The Church of Jesus Christ of Latter-day Saints into one that fits comfortably within the American mainstream, a feat no less remarkable. Hinckley, who died Sunday at the age of 97, had many of Young’s gifts as a leader and a builder, though not Brother Brigham’s rough-hewn ways. Hinckley was famously at home in any company, from world leaders and presidents to the Mormons at home and abroad who both revered and admired him. He was a leader with vision, stamina, native wit and the intelligence to apply his many gifts to his calling as a religious leader, but also as the brilliant chief executive of an enormous and complex corporation. In both roles, Hinckley was a decisive, penetrating presence, a natural businessman and a formidable negotiator who knew how to be blunt. In his ministry he was an articulate and inspiring speaker and beloved of his people. Once asked what he would have liked to do had he not followed the call of his church, Hinckley said that he just maybe would have had a future as an architect. The answer was typically wry. Hinckley was the most prolific builder in the history of the LDS Church, and his attention to architectural detail was legendary. The remaking of downtown Salt Lake City, entirely with church resources, was Hinckley’s plan as much as anyone’s, and is just one of the projects that will bear tribute to Hinckley the builder, and the architect. When Hinckley took over as president of the church in 1995, he had spent years as the de facto, day-to-day leader in the administrations of presidents who had become enfeebled. But on that first morning of his presidency, he stood before reporters and cameramen he had invited to a news conference, the first in memory to have been called by an LDS prophet. With the members of the Quorum of the Twelve Apostles seated in a row well back from the podium, Hinckley commanded the moment, fielding questions with ease and aplomb, driving home the point to Latter-day Saints and the world at large that the Mormons now had a leader who would be out among his people, delivering a message of faith, hope, love – and hard work. In fact, Hinckley would acknowledge if pressed, that he disliked traveling. But he put that aside to become the most peripatetic Mormon leader in history. When the number of Latter-day Saints abroad began exceeding the number in America, Hinckley paid them all due attention. He wanted them to know that a living prophet loved and cared for them. Anyone who saw him move in the crowds of his followers from Africa to Asia could see his tears and smiles and know for themselves that he did. One need not wait for history to judge the worth of Gordon B. Hinckley. His contributions to his church, and to the city that was his home, are incalculable. His legacy, quite simply, will endure as long as Brother Brigham’s. 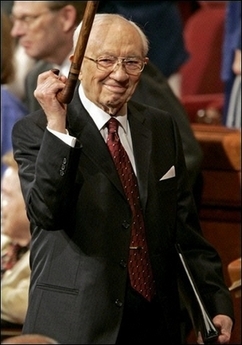 President Gordon B. Hinckley of the Church of Jesus Christ of Latter-day Saints died this evening. He was 97. Hinckley’s life spanned the 20th century, a time marked by LDS global outreach and technological advances. Hie saw his church evolve from a tiny sect in the Intermountain West to a respected religious movement with more than 13 million members worldwide. He embraced each new communication device, from radio to satellite to YouTube, as a chance to spread the Mormon word. He began his career in the 1930s as a missionary defending the faith on a soapbox in London’s Hyde Park and lived to see the country’s first viable Mormon candidate for president. Through it all, Hinckley worked tirelessly to gain acceptance for his church on the world’s stage. What Is It About Mormonism? There are already several very well done posts throughout the bloggernalce about the recent article by Professor Noah Feldman, see also here. The article What Is It About Mormonism?, published in the New York Times Magazine, is so well done, I wanted to preserve it once it slips into archival oblivion at some future point in time; however, while I am at it, I will also catalog, as best I am aware the excellent ‘nacle posts with their respective links, and invite you to read and comment on them at their respective blogs. If more show up, I will certainly add them. Or, if I have missed any, please feel free to let me know, and I will add as well.